I just put the dough for refrigerator potato rolls in the refrigerator to rise. These are easy and flexible dinner rolls and the dough can be made in advance and kept in the refrigerator for 1-3 days. Try putting some in the fridge today! Prepare mashed potatoes for 1/2 cup. In a large bowl place 1 1/2 cups of warm water that is at 105 to 115F. Water that is too hot will kill the yeast, too cold will slow down the yeast action and cause the rolls not to be as light. Sprinkle the yeast over the water. Add the sugar and the salt and stir with a spoon until completely dissolved. Let stand a few minutes and the mixture will start to bubble slightly. Add eggs, butter, mashed potatoes, and 3 cups of flour to the mixture. Beat with an electric mixer on high until all of the ingredients are combined and the mixture is smooth. Add 2 cups of flour and stir with a wooden spoon until completely incorporated and smooth. Add the remaining 1 1/2 cups of flour mixing with your hands until smooth and stiff enough not to stick to the side of the bowl. Brush the top of the dough with 1 tbsp melted butter, cover with a piece of waxed paper and a dish towel and place in the refrigerator for 2 hours, or until the dough has doubled in bulk. Remove from refrigerator and punch down with your fist. Cover and refrigerate. The dough can be refrigerated for 1-3 days punching it down once a day. 2 hours before you are ready to serve , remove the dough from the refrigerator and shape. 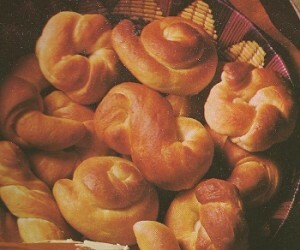 These make great crescents, figure 8s, snails, or fan-tan rolls done in a muffin pan. After shaping the dough, cover with a towel and let rise in a warm place (85F) until double in bulk, 1 hour. Preheat oven to 400F. Brush rolls with butter or with egg and seeds if you are using. Bake 12 minutes or until golden. Serve warm. This entry was posted in Recipes and tagged recipe, refrigerator potato rolls. Bookmark the permalink.